Jon and Mindy Hirst are co-founders of Generous Mind, a think tank devoted to helping people be generous with their ideas. Life becomes much easier when you realize that what is holding you back is simply a truth denied. The denial often comes because of a loathing of a truth, but when you surrender to belief, though your whole being hates the idea of it being true, there is freedom. There are many examples of this. A simple, but real one for me is that I am an introvert. My sisters, outgoing and beautiful, amazed me at parties. They could work a room, charging it with energy. I tried for many years to be like them. It never worked. In a room full of people, I felt guilty or silly for wanting to sneak away someplace quiet. I would tell myself, “I should be more social.” Or “I can be more fun.” And so I was stuck in a bad cycle of not believing the truth because I didn’t want something to be true. Now that I’m older and know myself better, there is an acceptance of who I am. No longer to I have the same drive to change, but can simply know how I was made without feeling bad about it. Believing the truth that I previously denied brought freedom. It rained this Fourth of July, deterring us from going to see the fireworks. Disappointed children filled our car as we drove to Blockbuster for a family video night. As we walked out of the double doors, a bright double rainbow greeted us in the sky. We decided to try to find the end of the band of colors. We almost found the end too. We drove until we found where it looked like it faded into the park near our home. Was it in front of or behind those apartments? Yes, no, well, maybe. The colors paled until you couldn’t tell exactly where it ended. But it looked so close, like you could run out into the field and stand in the fading colors. It was a once in a lifetime experience; this quiet display of colors standing in stark contrast to the loud, sparkling display of fireworks I’ve seen many a fourth of July. This silent rainbow reminds me of our freedom from fear of destruction by a flood—of a faithful God who will take care of us. The first rose blooms began to open when my mother in law noticed that in the greenery was an enemy camouflaged. The winding weed curled its way from the base of the rosebush around the branches and up to the buds. By the time the bush was ready to bloom, the weed was ready to choke the budding flowers. It was as if someone planned the whole thing. We tried to unwind the curling vine, pricking ourselves along the way, but it was tedious work. Getting the vine from the roots seemed to be the best strategy, as it killed the nasty weed. 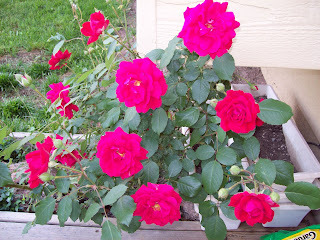 Within a few days, the roses bloomed, healthy and strong. We need to make sure that weeds do not grow up in our lives, wrapping around us, ready to choke at just the moment we’re about to be productive. We need to watch for them, and cut them off at the roots before they become so entwined in our lives that we can’t get untangled. We do a lot of talking about going with the flow around here. Unmet expectations are met with sad faces and tears, as we try desperately to help our children understand that things won’t always go their way…and that’s ok. Tonight we went to McD to get ice cream and play in the playland. They were cleaning, and the kids weren’t able to play. Small disappointments, but big for them. I hope they learned that we can still have a nice time together even when things don’t turn out like we had hoped. I had no idea that tree climbing would be the activity of choice this summer. We have now branched out into big kid-ness and it’s disturbing to see my baby hundreds of feet in the air, supported only by the branches of an overgrown bush. I hope the branches are strong, I try not to imagine her falling to the ground, feeling the sensation of the wind being knocked out of you, staring into the sky. 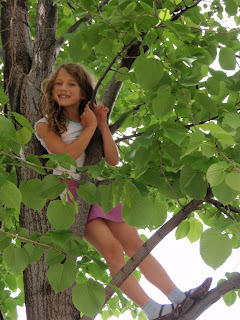 I did my share of tree climbing—and falling and am faced with the concrete reality that I am no longer in control of my daughter’s life. I have to trust her; and even more, I need to trust God with her. The sudden breath of oxygen reminds me that no matter how intense life is, I still need the basics to survive. I can put the base needs aside for awhile to concentrate on something intense and important, but eventually I will have to meet those needs. Remember to breathe, take care of the basics. Don’t let work apnea steal away the quality of your life. The garden has sprouted. After a couple weeks of humidity and rain, the seeds have germinated (except for the pumpkin) and we have little seedlings. I’m thankful that my garden in in the backyard and in fenced in, even though the fence our gate is attached to rocks back and forth whenever I go in and out of it. The deer and bunnies won’t eat my delicate shoots, like they ate my infant lilac bush and lily in the front yard. Now is the time for protection. Is there something in your life that is a new shoot that needs protection? Maybe a new habit or attitude you are cultivating? Make sure to keep it safe from the things that may nibble it down to nothing. Be proactive. Pray, ask for prayer, guard it. 6 Do not forsake wisdom, and she will protect you; love her, and she will watch over you.